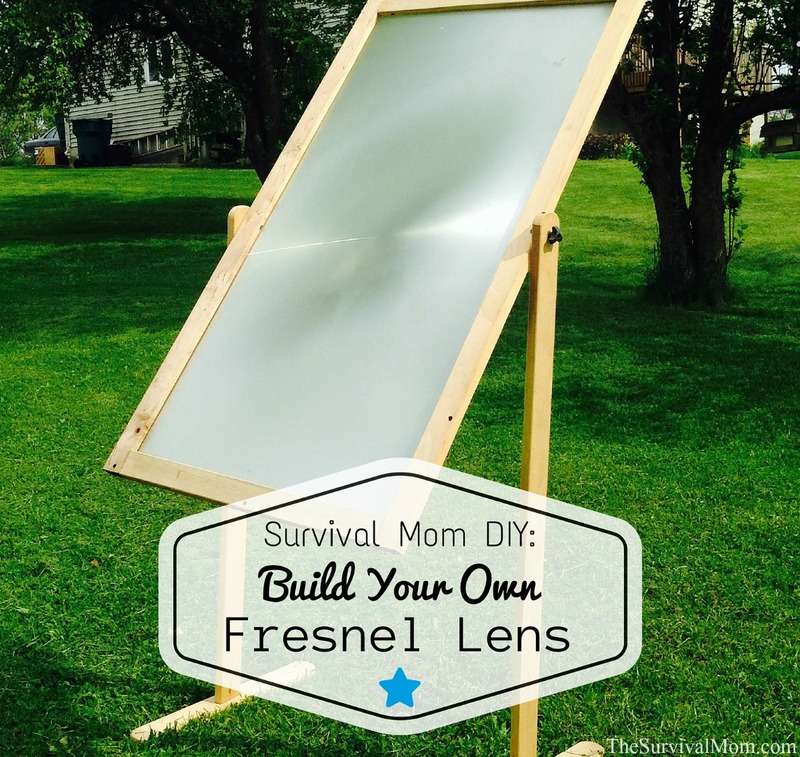 The story of my DIY Fresnel lens began three years ago when I lost my house and all its contents in a fire. It started around 4:00 a.m. when my daughter got up and fluffed her job uniform in the dryer. We had no idea the dryer would short out and burn through a gas line. Later that same morning, I woke up and smelled smoke. It looked a bit hazy in the house, and it smelled acrid to me, so I woke up my husband and son and they began to look around for the source of the small. My husband checked the wood stove, it was fine, but when he opened the basement door, fire flashed over the room. Once the fire fighters left, everything we had owned was a wet, smoky, smoldering mess. I didn’t think anything could be saved at that point, but I was wrong. If we could, we knew that lens could be fashioned into a frame and become a functioning Fresnel lens. With that lens alone, I could make an outdoor oven, but we quickly encountered the next problem: we didn’t have any tools! We dug through ashes and debris where the garage had been, and found a screwdriver. With just that one tool we were able to take out the screws that held the TV together where we could. When the melted plastic proved to be a challenge, we just beat the crap out of it with the handle of the screwdriver to get to the inside of the TV! All this effort paid off. This big, beautiful, rectangular flexible lens came out completely intact! 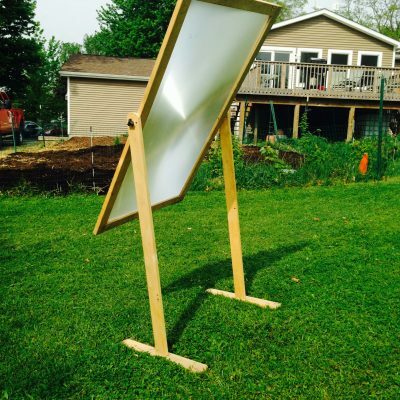 My next step was to contact my friend, John, a woodworker, to see if he could help me build a frame that could resemble a standing mirror, with a way to pivot the lens. John was happy to help, and he had tools! I couldn’t provide anything but the lens. Believe it or not, this small project gave me something to focus on rather than all our losses. If you’re unfamiliar with the Fresnel lens, imagine a giant magnifying glass. You can start a small fire by directing sunlight through the magnifying glass onto a tiny pile of wood shavings or paper. Now imagine that magnifying glass many, many times larger and you have a Fresnel lens. I headed over to John’s shop with my lens. I should mention, there are two types of these lenses: linear and spot lenses. Most lenses coming out of the older big screen TV’s are linear, and produce a more diffused area of heat when the sun strikes the center of the lens. If you are really lucky, you may get a spot lens. It focuses the sun into a small focal point on the lens, and you may be able to melt metal with it. Next, we worked on making two “T” shaped legs, with the “T” being the base touching the ground. A hole was drilled about 2″from the top of each leg. The lag bolt that was sticking out of the rectangular frame, was inserted through the top of the leg. John added a small plastic knob to the outside to keep everything in its place. Voila, it was finished! Since it was a sunny day, we experimented with it, by placing a piece of heavy cardboard on the ground, and angled the lens towards it. After several seconds, smoke began to appear. Then the cardboard began to burn. With that, I knew it could generate heat. My next step was to learn to cook with it. As an off-grid cooking method, a Fresnel lens is a whole different animal than a solar cooker, such as the Sun Oven. A Fresnel lens is able to focus the power of the sun so directly that it can start a fire within seconds. Therefore, a couple of safety measures must be in place. First, everyone around the lens should use dark safety glasses to protect your eyes. The glare from this lens is extreme and corneas can become permanently damaged. (I also recommend sunglasses when using the Sun Oven, as those reflectors cast extreme glares as well.) Second, it’s best if the cooking area is free of anything flammable, such as grass, leaves, and twigs. You want to cook just a pot of food, not set the whole backyard on fire! A third important point is to never leave the Fresnel lens out in the sunlight without being there to supervise. This isn’t the type of cooking or baking that allows you to wander away and clean house or watch a TV show while the food is cooking. Some people have use spot lenses to melt metal. That gives you an idea of the capabilities these lenses have. When using the lens to cook, I’ve mostly used cast iron skillets and pots. I simply set the pot on the ground and aim the lens toward it. I’ve found that I get good cooking results even if the pot of food is slightly to the left or right of the direct beam of the lens, although you can move either the pot or the lens, whichever is easier, to keep the sunlight directed toward your food. Some folks I know use Pyrex dishes, but I haven’t tried that, yet. Cooking time will depend on cloud cover and the food itself. A pot of soup will cook up more quickly than a whole chicken. I recommend keeping a log of everything you cook and the length of time it takes. That will be your best gauge for cooking times, although one person reported that a hot dog was burned to a crisp in just about a minute. Here’s an interesting forum discussion about these lenses. 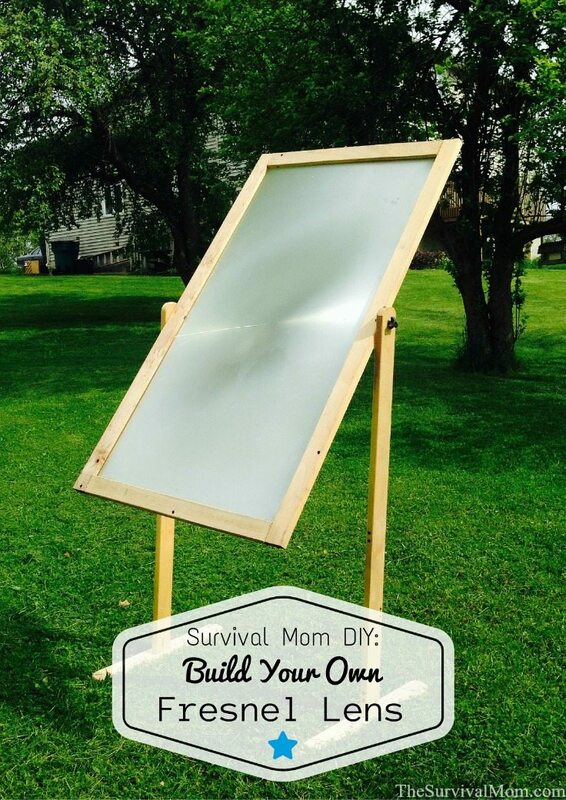 If you decide to make one of these yourself, remember, SAFETY FIRST, and then have fun trying this new, solar powered wonder. The focal length of the lens determines the sweet (HOT) spot. You can move the cookware closer to or farther from that spot to spread and reduce the heat thus providing more even cooking. A lazy susan made of a metal plate turned by a small DC motor and a worm gear can also help distribute the heat more evenly. If you’re going to reach in to move a container to follow the sun, be VERY careful. Remember, the beam can melt steel and quickly set 2x4s on fire. It is far safer to move the lens itself. Heating one end of a large, black griddle allows you to do eggs, bacon, pancakes, etc. on the other end. Again, watch that beam – it moves! Yikes! this thing may work, but it sounds WAY too dangerous to use, unless you are some type of wonder woman/man! LIke the above comment, how do you simply shift the food without cooking yourself? How do you know it isn’t going to burn the town down, since you can’t seem to control it ( above comment says the beam moves)??? And there is the directive not to leave it alone (no duh!!!) so….it doesn’t seem very time saving, in fact the opposite. Sorry I seem so negative, but this actually scares me! NOT for beginners, or those that aren’t techy savvy, IMO. Maybe a few more articles and some SERIOUS details. I use welding goggles and ordinary pot holders when turning a dish. The beam moves as the same rate as the sun tracking acrosd the sky. So, I stay stay home & monitor it. If I don’t want to stay home, I can use my Solavore Sport Oven. I like the use of free energy, not contributing to pollution, and not being dependent in a fuel source. I like many options! If you are responsible & vigilant, it shouldn’t be a problem.